Traditionally I’ve never been one to put a great deal of effort into Halloween. This year, however, I decided I wanted to go as Rick from “Rick & Morty”, and i wanted the centerpiece of my costume to be a fully-functional portal gun prop (it could be argued that the costume was just an excuse to build the gun). 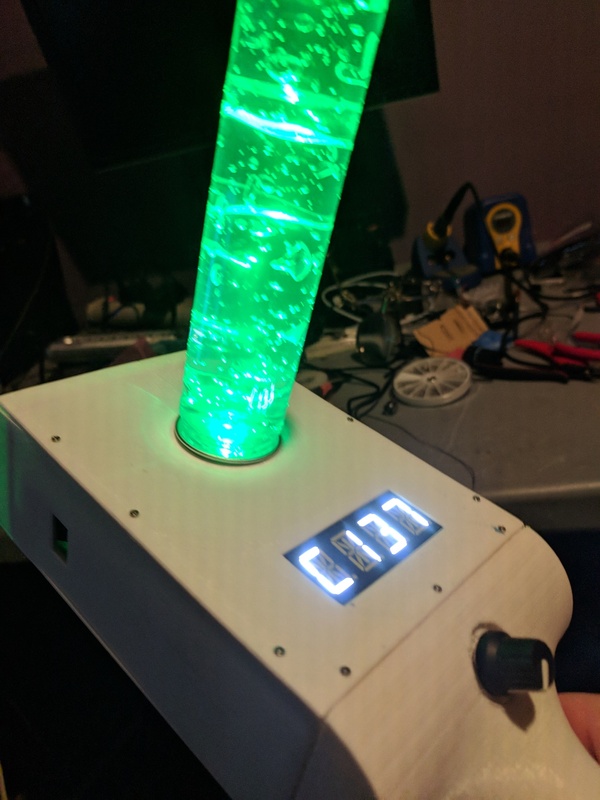 So, I set out to build the Rickest portal gun of them all: a fully 3-D printed replica containing a micro projector powered by a Raspberry Pi that could project fully animated portals with sound. The first thing I did was some research. 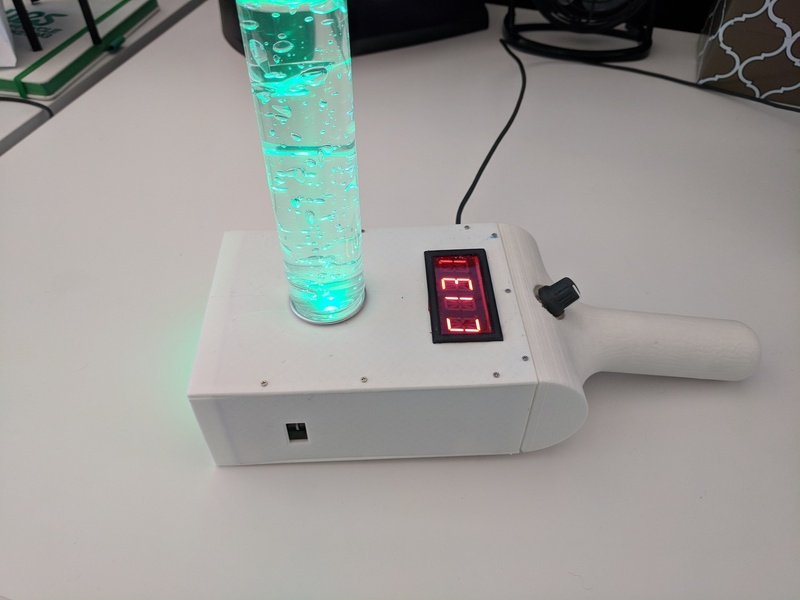 I immediately came across this project, which is very impressive, but it was rather limited due to the use of a projector with an SD card slot. He can’t control the projector without it popping up its OSD, so the animation is always looping, and he uses some clever hacks to only show it when he wants it to be visible. I knew I could do better. My next step was to get an idea of the dimensions for the gun I was going to build. After checking out dozens of other projects on the web I settled on having the main body of the gun be roughly 6″ long, 4″ wide, and 2″ high. This made the gun look aesthetically pleasing, and would just barely fit inside my printer’s build volume. With the dimensions chosen and some rough sketches made I set out to select the parts to go inside the gun. A Raspberry Pi Zero was the obvious choice for the controller, since it’s cheap, tiny, and has enough horsepower to run the animation I wanted to display. I also settled on a Quad Alphanumeric Display from Adafruit for displaying the selected destination universe. The display is controlled via I2C which is perfect for interfacing to the Pi. It is available in red (and several other colors), but red was out of stock at the time so i went with the white version and a red plastic filter. For the projector I settled on an APEMAN Mini Projector from Amazon. 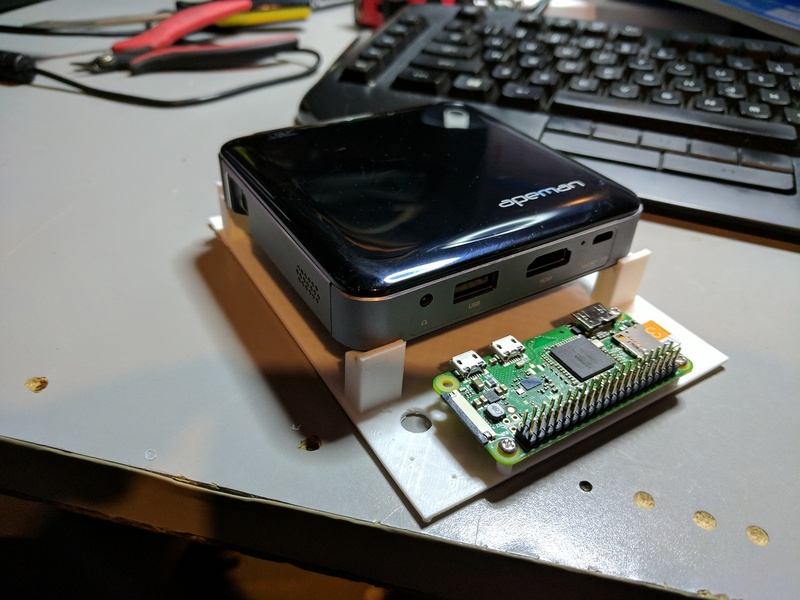 It has a decent output brightness, built-in speakers, and a USB output that can power external devices from its internal battery, meaning I wouldn’t need to wedge in another power source for the Pi and LEDs. It also happens to be 4″ x 4″ square which perfectly fit with the dimensions I had decided on for the body of the gun. At $200 it was by far the most expensive piece of this project! 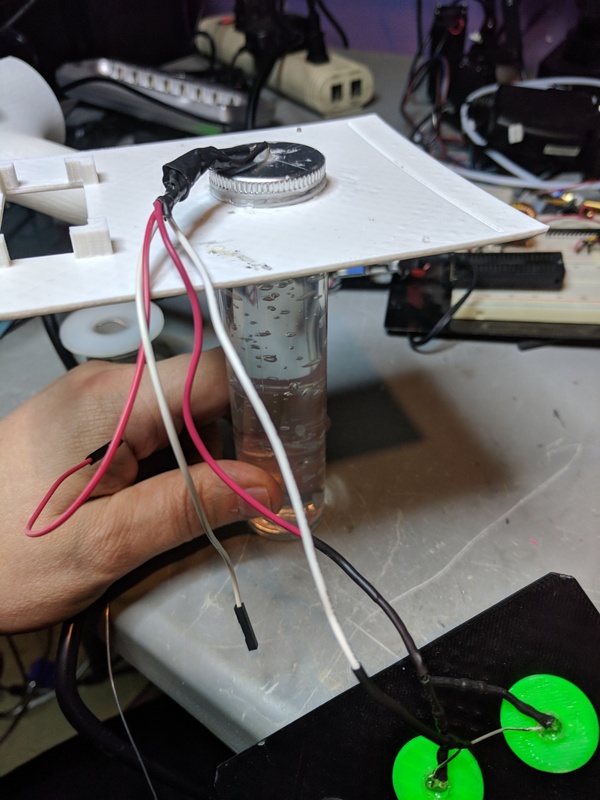 Finally, I picked up a simple rotary encoder for the control knob, and some DIY HDMI cable parts from Adafruit to build a short, flexible cable for connecting the Pi and the projector. With my parts acquired I began building a prototype. I framed out a basic version of the body with cardboard so that I could test fit everything. I then hooked up everything the way it would be connected in the final product and did some testing to make sure everything played nice together. 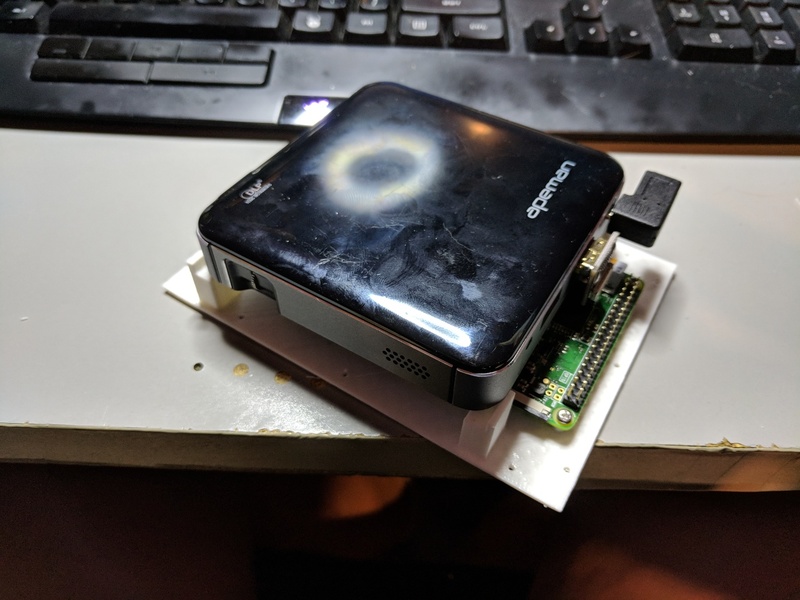 On the left is the projector, connected via an HDMI ribbon cable and a home built USB power cable to the Pi, which is in turn wired to the display and the rotary encoder. Near the top center you can see my cardboard prototype for the gun body. With the hardware proof of concept built I set out to design the software. My plan was to write some code that talked OpenGL directly to the GPU on the Pi, bypassing the need to run an X server. I was hoping to write a fancy shader that would actually generate the portal directly, but settled for a simpler setup with a static image and a modified version of a swirl filter shader that would rotate the static image. It also scales the image to create the open & close effects. This actually took surprisingly little time to create; I went from no code to a working prototype in a couple of hours. Next I had to add sound effects. The projector has two internal speakers so all I had to do was redirect the Pi’s audio output over the HDMI. The problem came when I tried to find some good sound samples to use. I found a decent “portal opening” sound, but was unable to find a matching “portal closing” sound. In the end I used Audacity to copy a portion of the opening sound and reverse it. Last up was the alphanumeric display. This was simply a matter of using Adafruit’s sample code for the Arduino and converting it to run on the Pi. 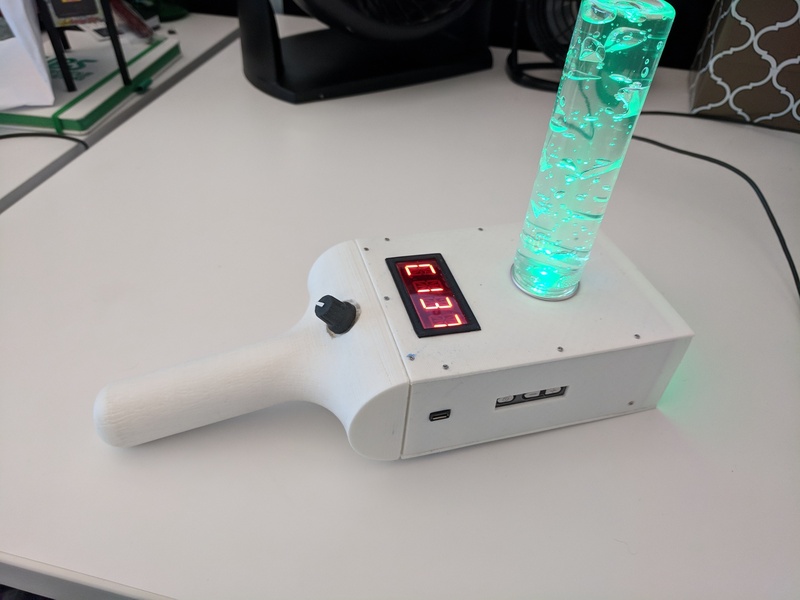 I had originally programmed it to just count sequentially as the knob was turned, but I realized that for a “real” portal gun that would be a horrible user experience, so I implemented a “favorites list” of known destinations from the show and had the knob scroll between those. 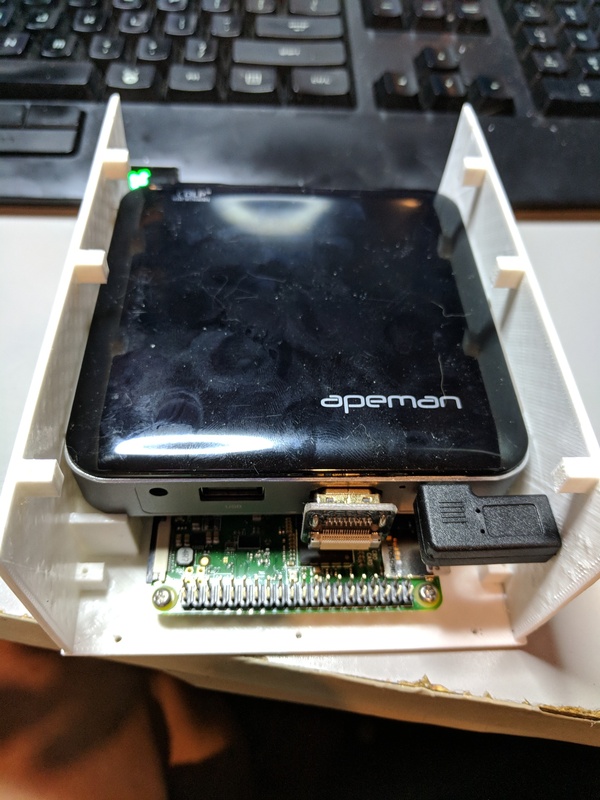 Once the software was finished I created a “pg” user on the Pi and set it to auto-login and run the app as soon as the Pi boots. In the end I spent the better part of a week writing and tweaking the software. It would have gone faster if I’d had a cross-compile environment set up, but I don’t, so I had to do all my compiles on the Pi. It is NOT a fast process! By far the most time-consuming part of the project was designing and printing the gun body. I pushed my FreeCAD skills to their limits designing all the pieces, and ended up going through several iterations before settling on a final design that worked. 1, My original design for the box (minus lid) was going to be an 11+ hour print. Every time I wanted to tweak anything would mean yet another 11 hours, not to mention all the wasted plastic. 2. I kept running into problems when trying to design complicated designs in FreeCAD; I would want to go back and change something and it would end up destroying my entire design. This is probably just a skill-level problem on my part, but in the end it was faster for me to design multiple smaller pieces instead of a few large ones. 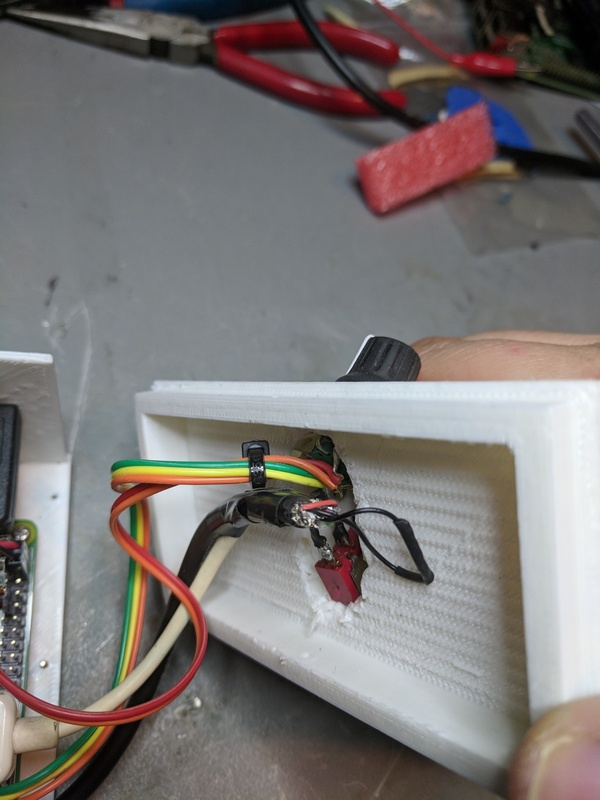 The four square posts are for holding the projector, which needs to be centered vertically in the gun so that the projector output is lined up with the center line on the front panel, and to make sure the projector’s air vents can get some circulation. The small circular posts are for holding the Pi, and the slot along the front will hold the front panel. The large circular hole is where I was originally going to put the power switch, and all the tiny holes are the screw holes. The projector fit perfectly, but the Pi was hanging over the back edge just a hair. In addition I decided I wanted the Pi farther back so that I had more room to attach the handle to the top and bottom plates. Keen observers will also notice the missing mounting post for the Pi; it broke off while I was trying to screw the Pi down. After a couple more tries I had a winner: Here you can also see the right-angle micro-USB connector I found on Amazon. By pure luck it is exactly the right size so that it lines up with right edge of the gun, meaning I would be able to charge the projector without opening the gun. It’s at this point that I hit my first snag. The HDMI ribbon cable was built with right-angle connectors, which was fine on my original design, but with the Pi partially underneath the projector the connector on the Pi end did not have enough room. So, back to Adafruit i went for a straight connector. Next up were the side pieces. 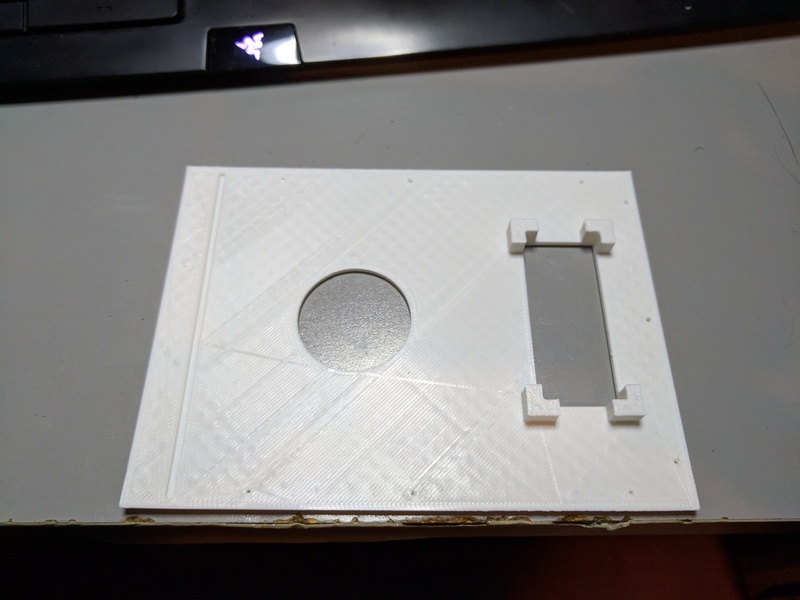 These would need to have small tabs to allow them to be screwed to the top and bottom plates, and would also need some carefully positioned access slots in them for the projector’s side controls and the micro USB charging connector. 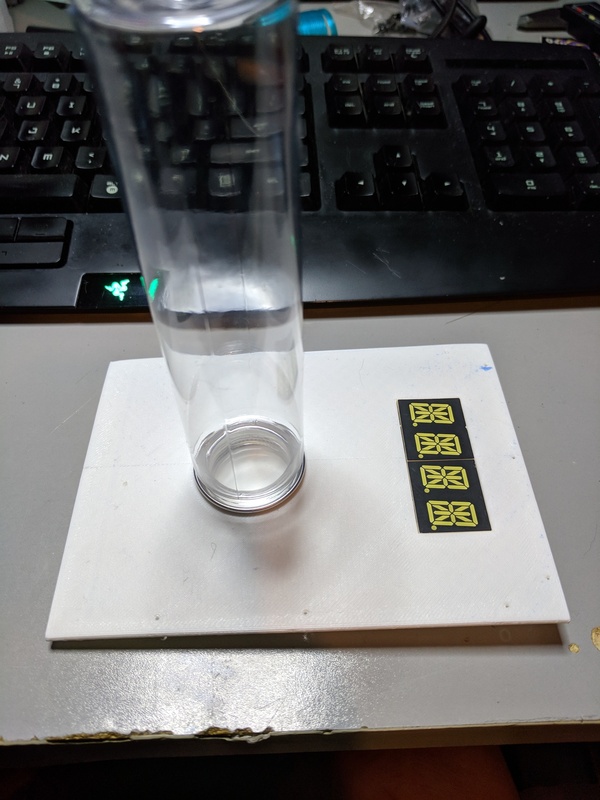 This was a bit tricky because the corners and edges of the projector are rounded just enough to make it difficult to get an accurate measurement with my digital caliper. I went through several iterations of the side panels before finally coming up with ones that fit; fortunately they are small and printed fast. Perfect! In fact the display actually just snaps in place on its own; originally I had intended to drill some small holes and secure it with screws, but i broke my 1.1mm drill bit so I just left it as-is. 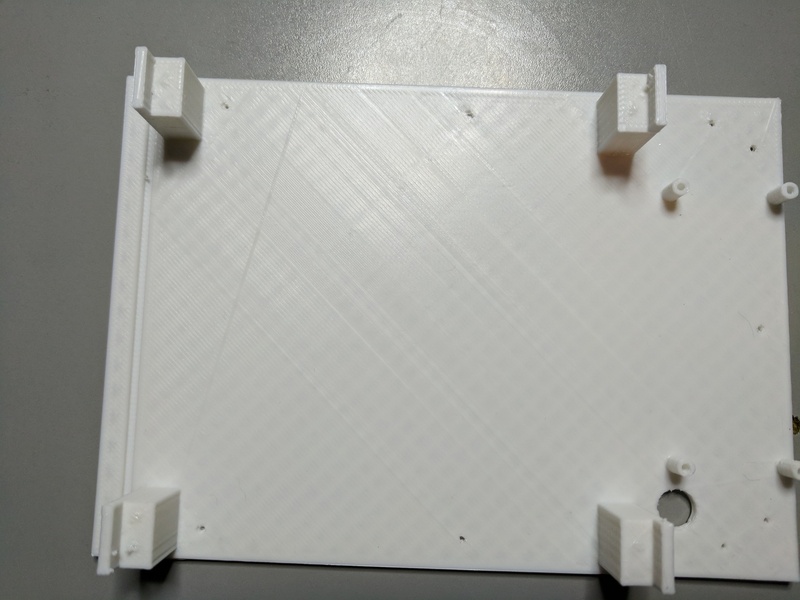 Last, but not least, I printed the front plate. I did this last because it’s black and I didn’t want to change the filament in the printer until I was done printing the white pieces. I also printed two domes out of translucent green filament and mounted those in the front panel. The domes have a hollow space inside that is just large enough for an LED. Note that there are three holes but only two are filled; the third hole is the output for the projector. Finally here’s the body mostly assembled, minus the yet-to-be-printed handle. 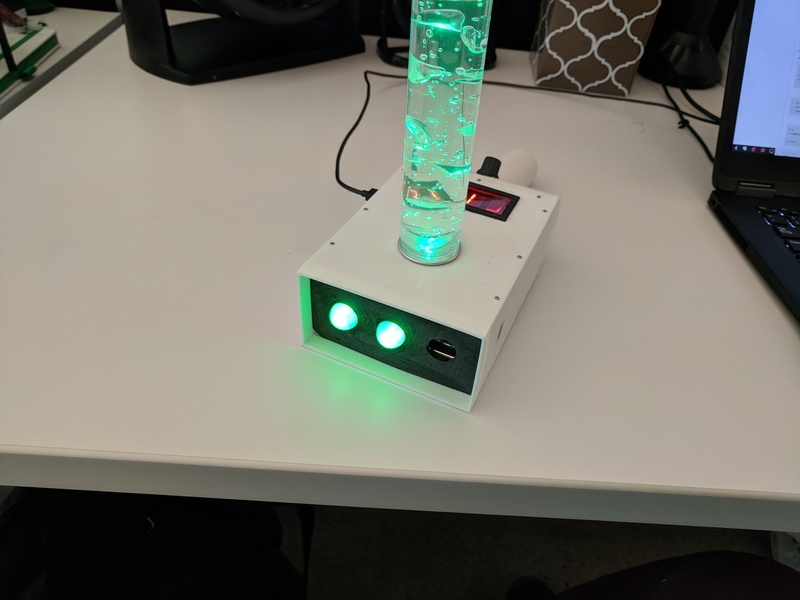 The top isn’t screwed down yet because I still need to fill the portal fluid cylinder and also do all of the LED wiring. Going into this I knew what the handle should look like, but I had no idea how to design it. It took me the better part of a day to design this one piece, and it was the most frustrating day of the entire project. The handle, with its non-square angles and curves, was well beyond anything I had ever done in FreeCAD before. Unfortunately my measurements for those access shafts were a bit tight so I had to carefully drill them out to make room. With the software done and all the pieces designed and printed it was time for final assembly. I started with the portal fluid. 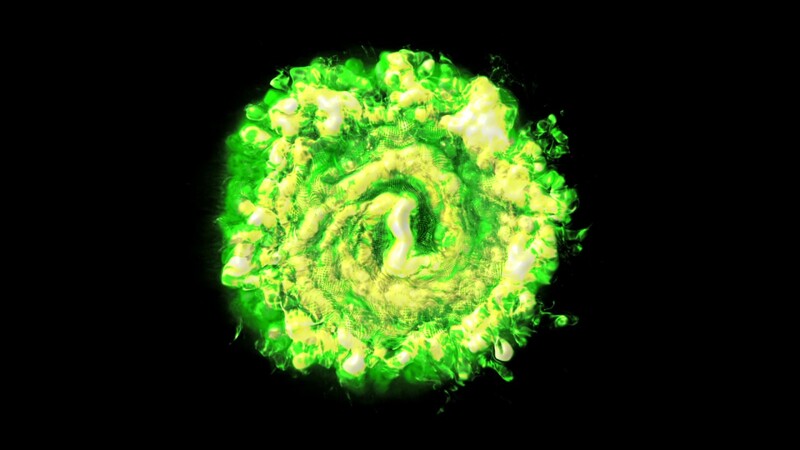 For this I used some clear Aloe Vera gel to provide a cool bubble effect. 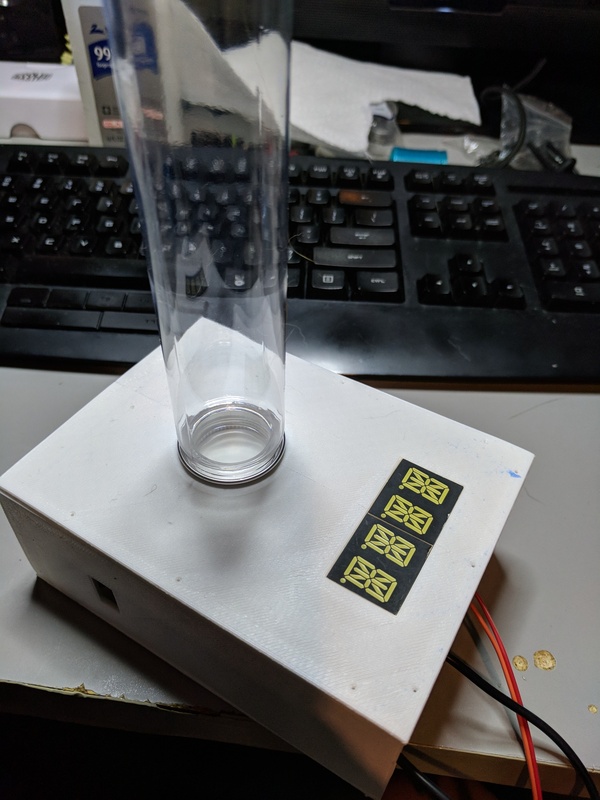 I also drilled two small holes in the lid for the leads of an LED (after making sure the lid was non-conductive of course!). I mounted a super-bright green LED on the inside of the lid and secured it with more Loctite. Next I glued LEDs in each of the green domes on the front panel, and then wired them all in parallel along with some 200 ohm current-limiting resistors. All connections are soldered and covered in heat-shrink tubing for strength. The whole LED circuit is then connected to 5V and GND on the Pi. As long as the Pi is powered on the LEDs will be lit. Next I connected the top display to the I2C and power pins on the Pi. The display requires two power connections; a 5V supply, and a supply line tied to the desired voltage level of the I2C pins, which in the case of the Pi is 3.3V. After the display was connected I turned to the handle. First up was the rotary encoder. It requires five wires: three for sensing rotation and one for the pushbutton function. Two of these would go to ground and the rest to GPIO inputs. Once it was connected I carefully mounted it in its access shaft on the handle, taking care not to break the connections. 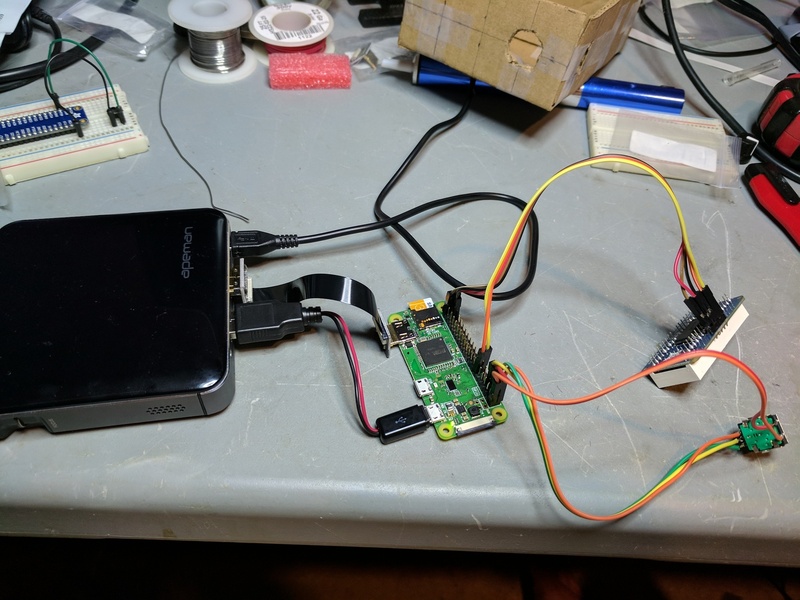 Next I cut the ends off of a USB-A to micro-USB cable and wired them together with the power switch in series, then plugged one end into the projector and the other into the Pi. I then mounted the switch inside the shaft I made for it on the bottom of the handle. As you can see there is one TINY thing missing, and that is the red filter over the display. I bought some red plastic sheets on Amazon and cut them to size, doubling them up to produce a deeper red. I also printed a simple black frame to go around the display, and carefully glued both in place with Loctite. And here’s a YouTube video of the gun in action! 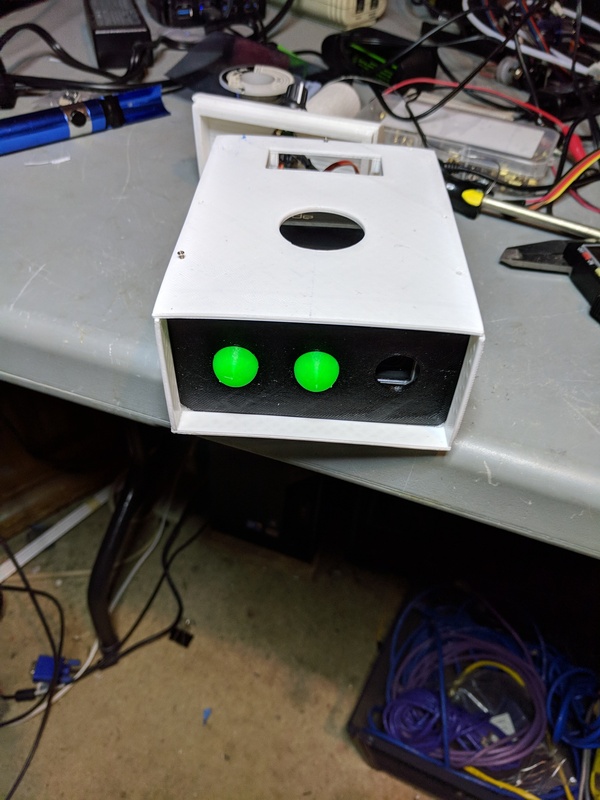 Posted in Projects and tagged portal gun, raspberry pi, rick and morty, rpi on November 16, 2017 by jthompson.